Timothy P. LeMieur, M.D., F.A.C.S. 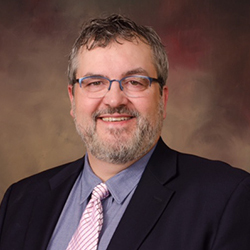 Dr. Timothy LeMieur was born and raised in Little Falls, Minnesota. He graduated from St. John’s University in Collegeville, Minnesota and earned a degree in Biology. After college, he spent two years working at the VA Medical Center in Minneapolis in Anatomic and Surgical Pathology. While at the VAMC, he learned human anatomy, gross pathology, as well as surgical pathology. He was also employed at the Minnesota State Capitol working with the Departments of Education and Transportation. He was the Senate Page for Senator Randy Peterson, now a Judge in the Minnesota Court of Appeals. Dr. LeMieur attended the University of Minnesota Medical School in Minneapolis from 1989 to 1993. He graduated from Hennepin County Medical Center’s Residency Program in 1999 and joined the surgical group at Cuyuna Regional Medical Center (CRMC) in Crosby, MN AND Riverwood Healthcare Center (RHC) in Aitkin, MN. Since joining the surgical group at RHC and CRMC, he has been trained, certified and privileged in many surgical procedures including laparoscopic gastric bypass, laparoscopic gastric banding, laparoscopic sleeve gastrectomy AND laparoscopic antireflux procedures including Nissen fundoplication and the LINX procedure. Dr LeMieur is also experienced in laparoscopic oncologic procedures including colectomies, partial liver resections and gastric resections. He is Chairman of the Commission on Cancer committee and was one of the primary members involved with CRMC/RHC obtaining a Cancer Center status. He also provides endoscopic care including the performance of esphagogastroduodenoscopy (EGD) and colonoscopy. He has experience in vascular procedures including peripheral arterial bypass and is one of the area’s primary surgeons dedicated to providing vascular access for hemodialysis patients. He is fluent in laparoscopic ultrasound and handheld ultrasound-guided procedures and biopsies. Dr. LeMieur has been a Riverwood Healthcare Center board member, a Minnesota Surgical Society board member, President of the Hitchcock Surgical Society at Hennepin County Medical Center, and currently is faculty for Minnesota Institute for Minimally Invasive Surgery (MIMIS) Surgical Fellowship. Dr LeMieur was also a member of the State Trauma Advisory Council (STAC) and was a part of Level 3 and 4 trauma development for rural hospitals in Minnesota. He was instrumental in helping RHC become the FIRST hospital in Minnesota to receive its Level 3 Trauma Center status. CRMC soon followed. He was named Outstanding Young Surgeon in the American College of Surgeons and has been the primary surgical preceptor for the Rural Physicians Associate Program (RPAP) for several years. Dr. LeMieur is always willing to learn and provide state of the art care to the rural Cuyuna Lakes and Aitkin areas. He is married to his wife, Michelle, and has four children.